These numbers reflect estimated student expenses for the 2019-2020 school year. Amounts will change slightly from year to year, but as the cost of college increases, the scholarship packages will correspondingly increase. Your official financial aid award will be included in a letter directly from Bowdoin. Students can often use outside funding to reduce summer and school year earnings expectations. The College will do everything possible to let the student benefit from awards received from outside sources before reducing their grant from the College. However, the student's total grant aid cannot exceed their federal need or the cost of education. Bowdoin requires all students to have health insurance. Students can waive the College Health Plan if covered by a family member or another plan. For financial aid students not covered by an outside plan, Bowdoin will cover the cost of health insurance. As part of your comprehensive budget, and to help with your planning for non-billed costs, a travel allowance is included. The amount reflects three trips between home and Bowdoin during the academic year. This is not an exact amount, but rather an estimate assuming the most economical and efficient travel options. A travel allowance is not included for students living in New England and New York. Grant aid is not provided for this expense. Travel expenses are typically covered by the student's summer and term time earnings. Students must maintain satisfactory academic progress, as evidenced by their ability to continue enrollment at Bowdoin. Students' academic records are reviewed each semester in accordance with the academic standards defined in the Bowdoin College catalogue. Contact the Student Aid Office for more detailed answers to questions about our Student Aid policies or procedures by emailing sao@bowdoin.edu or calling (207) 725-3144. Bowdoin is committed to meeting the full calculated need of all admitted students, and does so with grants and limited student employment. Bowdoin does not use loans in its aid awards. Approximately 50% of the first year class received financial aid during the 2018-2019 school year. 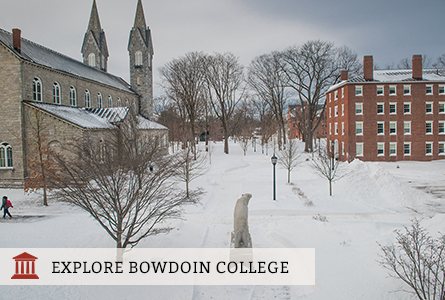 Use Bowdoin's Net Price Calculator to estimate the financial aid for which you are eligible.